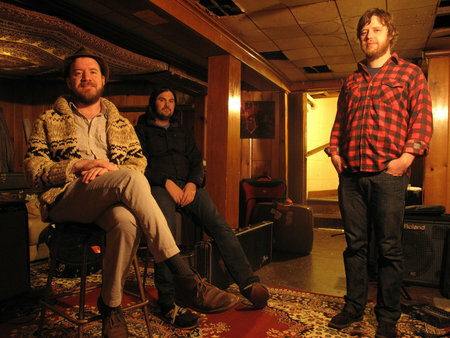 A steadily-rising trifecta of talented bearded dudes, grown from the musically fertile grounds of Seattle, Cave Singers play indie-folk music borne of their surroundings. From deep, dark, and complex songs that instill a sense of being lost in the wilderness, to upbeat, washboard-tinged tunes that beg to be danced and stomped to around a campfire, Cave Singers' roots reach further with each album they release. Since their 2007 debut, Invitation Songs, recorded right here in VanCity, they have sold out shows in their own backyard, toured across North America and Europe, and made some mighty happy fans along the way. 2011's No Witch is their first recording on the Jagjaguwar label and shifts toward harder, edgier multi-instrumental folk music and the natural maturing of dedicated musicians. Their new album Naomi will be released on Jagjaguwar in 2013.